Fall 2019 Room and board fees will established by the EOU Board of Trustees at the April 12, 2019 meeting. These rates include housing and meals for the entire academic year (Sept-June). A $250 Housing Deposit is due when applying for Fall 2019 housing and thereafter. Resident dining plans A-B-C contain both “Block” or all-you-can-eat meals in the Mountie Cafe and “Flex” dollars to use in Mac’s Grill. Alikut Hall features apartment-style housing for upperclassmen and transfer students. Each furnished apartment houses four residents in single rooms and includes two bathrooms, a living room and a kitchen. Alikut Hall residents may opt out of a dining plan. Eocene Apartments features apartment-style housing for upperclassmen and transfer students. Each furnished apartment houses two residents in single bedrooms in a two bedroom apartment, 525 square feet. Eocene residents may opt out of a dining plan. **Note: Eocene charges include fully furnished apartment, ethernet access, and utilities. If a student intends to cancel their housing application, they must do so by August 15, 2019 for Fall term applicants, December 15, 2019 for Winter applicants and March 15, 2020 for Spring applicants. Student must notify the Residence Life Office in writing of their intention to cancel or a $250 late cancellation fee will be assessed to their student account. Students can cancel their application by emailing the Residence Life Office at reslife@eou.edu, or by calling the office at (541) 962-3553. If a student decides to cancel their housing contract after Move-In, they will be charged $8.00/day for each day remaining in the contract. See Room and Dining Contract 2019-2020 section ID. Cancellation of Contract or XI. Charges/Fee for further details. Please refer to the Student Accounts webpage for payment details and options. 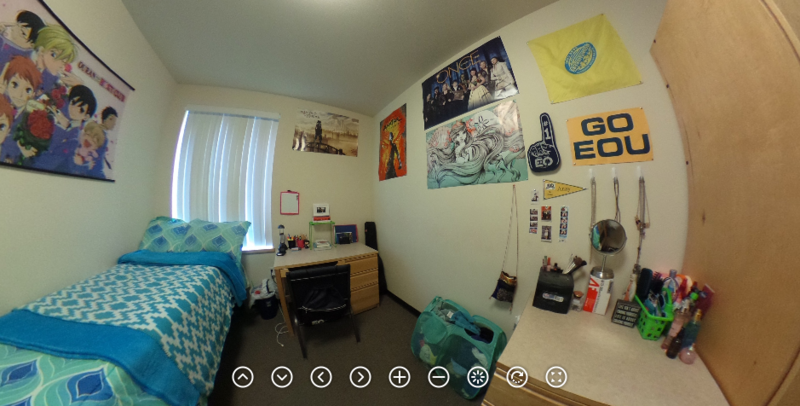 Experience our residence halls in 360°!